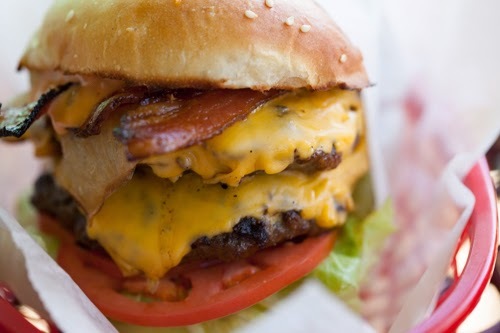 The Double Cheeseburger with Bacon from Bishop Burger Barn combines lots of flavors for a smokey, satisfying burger experience. Bishop Burger Barn in Bishop, CA is a beef oasis. Situated just off the main drag on West Line, it feels timeless in its small-town quirkiness. You walk up to a packed place. A little building with an outdoor window is where you order. A Drive through goes right through the line of people waiting to order. Outdoor seating spreads around the old complex, including a fenced in pet area out back. It took about 15 minutes to get my food on this very busy August Saturday. Bishop Burger Barn in Bishop CA features outdoor seating, drive-through, walk-up window and a great burger. My Nutella Shake ($4) came first. Very, very creamy and yummy. Just creamy enough to be sipped through a straw. I kind of ordered it on a whim, but on this 91 degree day it was very refreshing, with that chocolate-hazelnut Nutella goodness. The food came a few sips later. I ordered the double cheeseburger ($6.85) with everything including grilled onions (+25 cents) and bacon (+$1) It is quite a stack, it's a good thing they paper wrap it to keep it together. The patties are thick and hand formed and cooked a nice medium. They were tasty but not especially juicy. Lots of butter lettuce, fresh tomato and grilled red onions. The sesame bun was perfectly toasted. American cheese melted everywhere. The crispy bacon added a smokey note. With the optional thousand island dressing it all combined for a tasty burger. A local note: The Burger Barn uses Bishop-raised grass fed, Angus beef. The "crispy" fries were coated. 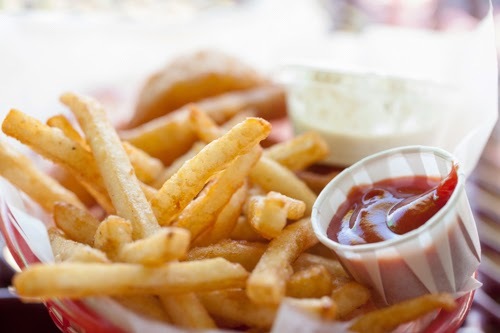 While I am not generally a fan of coated fries, they were crispy and hot. The onion rings were better. Beer-battered and thick, they were very sweet. They audibly crunched even as they cooled off. The staff brought ranch and ketchup without me asking, which is a big plus. I have to have ranch on my onion rings. This is a really fun, local treat. 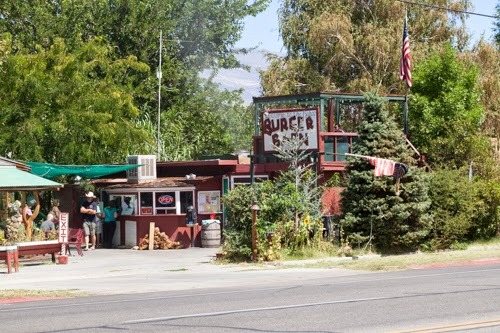 If you are making a trip up 395, take the detour a couple of miles to the Burger Barn. It's worth it. 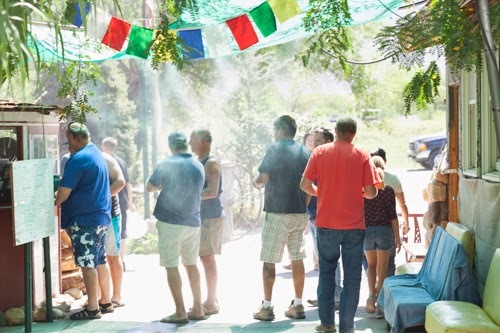 Misters work overtime on the line at Bishop Burger Barn on a 90 degree day in Bishop.